Old cars. If they’re old enough (in most states, more than 25 years old), they’re vintage, even antique, and perhaps worth the extra effort it takes to keep them running. If they are 15-25 years old, they are usually just basic transportation, and a basic pain. The body parts not rusted are crumpled. The driver’s window no longer winds down (maybe the entire door is rusted shut), so paying a toll, or dining at a drive-through fast food establishment, is yet another hassle. You prefer to drive at night, because the black exhaust cloud isn’t as obvious. What’s it going to cost me to fix it for the third time this year??? And the planet shares your pain. How sensitive of the planet! Princeton University economist Alan Blinder, whom I fondly remember as a columnist for Business Week years ago, a side job while vice-chairing the Federal Reserve and holding down the Princeton gig, would like to take that beast off of your hands. Because that black cloud trailing behind you isn’t unique. The state of California estimates that cars 13 years and older account for 25% of miles driven overall, but an astonishing 75% of all passenger automobile generated pollution. ECONOMISTS and members of Congress are now on the prowl for new ways to stimulate spending in our dreary economy. Here’s my humble suggestion: “Cash for Clunkers,” the best stimulus idea you’ve never heard of. Cash for Clunkers is a generic name for a variety of programs under which the government buys up some of the oldest, most polluting vehicles and scraps them. If done successfully, it holds the promise of performing a remarkable public policy trifecta — stimulating the economy, improving the environment and reducing income inequality all at the same time. Here’s how. A CLEANER ENVIRONMENT The oldest cars, especially those in poor condition, pollute far more per mile driven than newer cars with better emission controls. A California study estimated that cars 13 years old and older accounted for 25 percent of the miles driven but 75 percent of all pollution from cars. So we can reduce pollution by pulling some of these wrecks off the road. Several pilot programs have found that doing so is a cost-effective way to reduce emissions. Blinder says that his proposed Cash for Clunkers program would not only remove the worst polluters from the road, but the cash the government would pay for them would put money in the hands of people who need it the most, the poor (literally) gals and guys who can’t afford better. But, read the details, decide for yourselves. And, they’ve tried a pilot version in a few states successfully, and it seems to be economically viable. What’s not to like? Of course, this program might not be for everyone. MUDGElet No. 3 is driving again, after a lengthy stolen-vehicle caused hiatus, a double hand-me-down, 17 year old Honda Accord. Just over 60,000 miles. He’s scraping financial bottom just now, so I don’t think that Blue Book plus 20% would get him anything much newer or better. But, hey, it’s a Honda. How polluting could it be? The vehicle that graces today’s post is a Ford, from approximately 1950. From the wide array of very low cost stock photographs of such vehicles in the inventory at Dreamstime.com, yr (justifiably) humble svt‘s latest blogging resource, this one popped out at me. 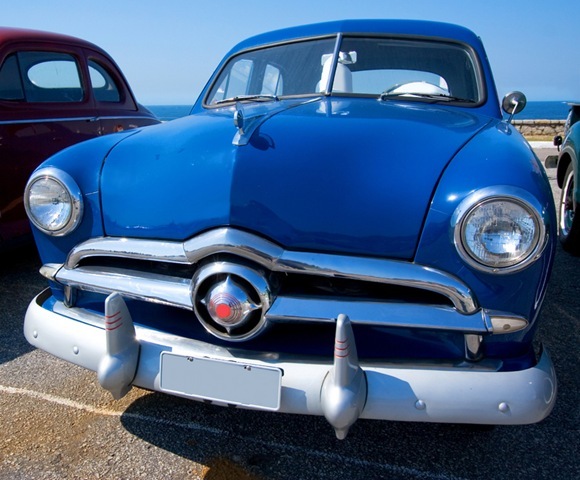 My dad had one just like it, around 1950, and I had a metal pedal car just like my Dad’s that three-year-old MUDGE called his “Daddy Blue Car.” It was ahead of its time (the pedal car, I mean — the full size Ford was a typical dog of its era: shiny but crude, large on the outside but cramped inside, and gas guzzling yet underpowered) — my pedal car used no gasoline at all, and emitted very limited carbon in the exhaust (my breath!). And, pedal-powered vehicles are apparently on a growth path; read somewhere today that, of all things, 27-inch tires are in short supply, as if a bunch of elderly bicycles have been pulled out of attics and basements and pressed into commuting service. But, only the fanatics are going to commute 60 miles round trip via bicycle; for the rest of us the Cash for Clunkers program might provide micro and macro benefits. This entry was posted on Monday, July 28th, 2008 at 9:06 pm and is filed under Economy, Environment, Government, Politics. You can follow any responses to this entry through the RSS 2.0 feed. You can leave a response, or trackback from your own site.